When I taught YA Literature to university students, I so enjoyed doing alegorical work with them, and they seemed to love it. I think it’s terrific to use in young adult literature, in that it gets them thinking in a more critical way. Well done again, Barbara! Keep them coming! 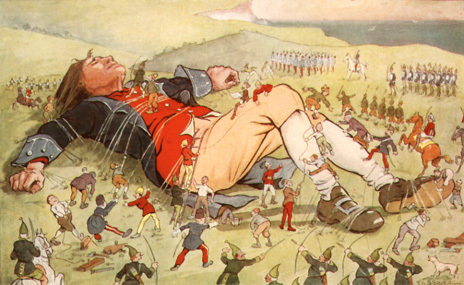 Did you know many nursery rhymes were originally political allegories? Without freedom of speech they were a fairly safe way to communicate views opposing the people in power. Great post. I remember reading most of those books in high school. The Great Gatsby is another book that we read and analyzed afterwards. I Love your analogies. You are a true Librarian who is also a fablous writer. My favorite allegory is “Hinds Feet in High Places” by Hannah Hannard. Thanks for explaining the underlying meaning of Animal Farm to me. I knew there was something there but couldn’t get past the sadness of the plight of the animals. Every time I try to write a meaningful, thought-provoking story I realize how depressed it makes me feel and always return to fantasy. Although, with that said, To Kill a Mockingbird is one of my favorite stories. Very informative, Barbara. Great examples of allegorical works.